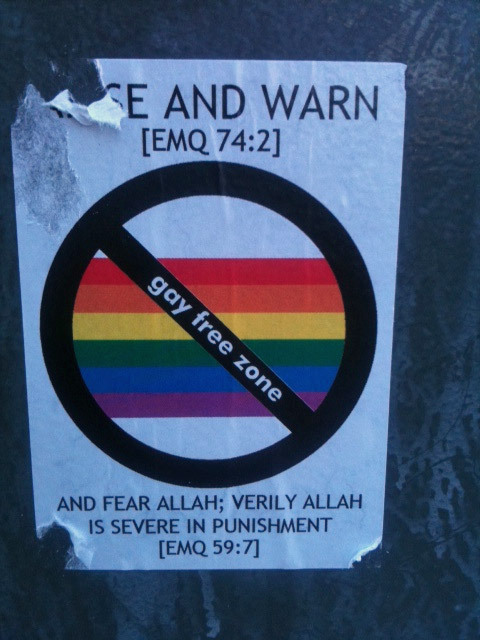 The stickers are apparently part of a larger campaign targeting LGBT muslims living in London, and threatening them with violence. Gay History Month poster have also been defamed, and leaflets calling for the killing of gays have also been handed out in public squares. The disturbing trend has many concerned for the safety of not only LGBT Londoners, but everyone. Equality campaigner Peter Tatchell – who has been attacked by Muslim groups three times in the capital – condemned the behaviour. He said: “These stickers are part of a trend by Islamists and fundamentalists to target LGBT people. It is happening at universities and in communities. The main victims of this hate-mongering are LGBT Muslims. “A venue attached to the East London mosque hosted a speaker who invited his audience to: ‘Spot the fag.’ There have been a series of homophobic threats and assaults by Asian youths on LGBT people in the East End over recent years. “I’ve been attacked by Muslim youths three times in and around Brick Lane. In all three attacks, the assailants shouted religious slogans. My LGBT Muslim friends who live in the area are nervous and anxious. They fear attack and dare not reveal their sexuality. “Only last week there were reports of threats being sent by Islamists to gay students at South Bank University. LGBT History Month posters have been defaced by extremist Muslim students. Several universities have hosted hate preachers who endorse the killing of LGBT people. “I appeal to Muslim religious and political leaders in East London to speak out against homophobia. We need a clear statement from the leader of Tower Hamlets council and from the senior imam at the East London Mosque. They should publicly condemn homophobia and call for tolerance within the Muslim community. “Both homophobia and anti-Muslim bigotry are wrong. Our communities know the pain of prejudice. LGBT and Muslim people should stand together, united against hate,” he added. Holy jeezums. People, this is London we are talking about here. The gay rights movement is lightyears ahead of where the United States even stand on the issue. It’s extremely upsetting to read reports like this. We sincerely hope British authorities are able to find those responsible for terrorizing this city. Are you upset to see this happening in England?